Whether you're layering your own quinoa bowl in the wee hours of the morning or have little ones' lunchboxes to pack in addition to your own, it's tough to get creative about healthy, portable, easy lunches when you're halfway through eggs. Here's a leg up on the lunch game. Today: Amanda Hesser's kids' lunches have been inspiring Food52 readers for years, and she's agreed to share her own strategy for making great ones. Our trusty co-founder Amanda Hesser is known for writing the New York Times Essential Cookbook and Cooking with Mr. Latte, but our personal favorite of her projects is a column here at Food52 where she lets us in on the contents of her kids' lunches and the strategies behind them. 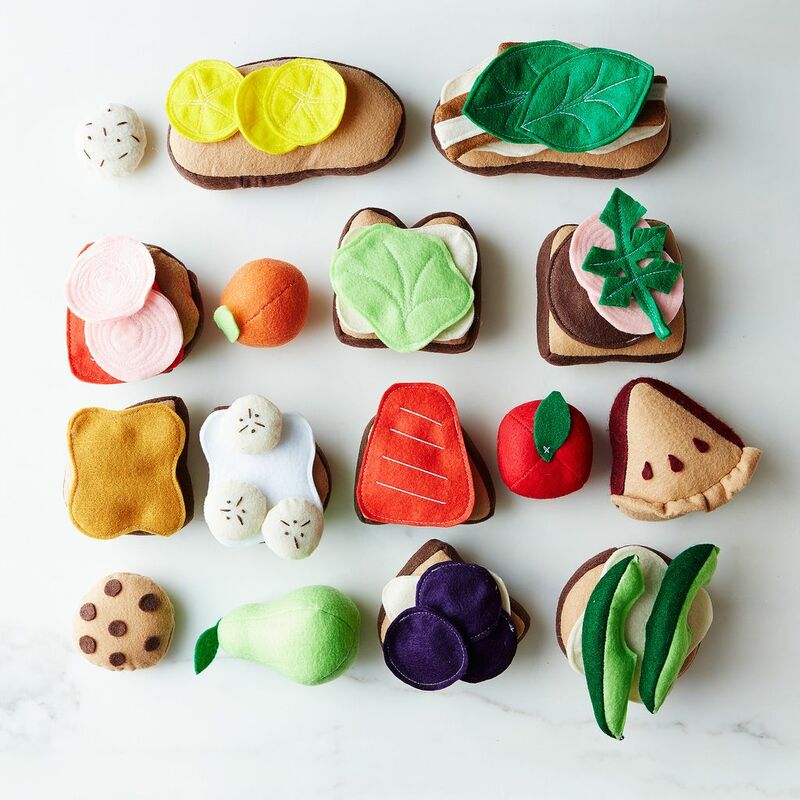 In honor of our newest felt food sets from Felter's Market -- which were inspired by Amanda's very lunches -- she's sharing her tips for easy, creative, and delicious lunchbox surprises. 1. 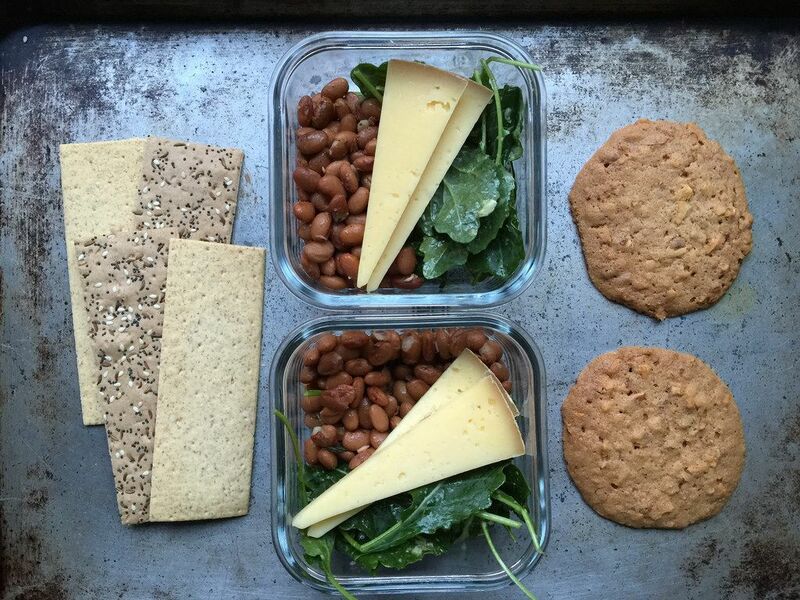 Accept that your kids won't eat all of their lunch most of the time. Lunchtime is short and social. Still, even if they eat a bite or two, and taste something new, you've done your job as parent and primary introducer of good foods. 2. From a lunch production perspective, the best lunches are grain, bean, or leafy salads because they can be made ahead and then just spooned into containers in the morning. On good weeks, I'll make a giant batch of rice or a grain salad, and am on easy street for days. Also, you can mix these up through the week by adding a hard boiled egg one day, or a roll of ham the next. 3. The worst lunches to make are sandwiches because a good sandwich (other than ham and butter, trademarked by the French) contains multiple components. This means you have to take these various components out of your fridge, open all the containers and bags, slice, spread, and layer them all. And then you have to close up every (stupid) container and bag before putting it away. Efficiency calamity! And yet, if you read my column, what do I gravitate toward? Sandwiches. Please do as I say and not as I do. 4. Always pack a treat. Stock up on good chocolates and cookies. People remember childhood treats forever. 5. These pickled onions are your best friend. Both sweet and salty, my kids devour them; the onions, tossed onto a salad your child hasn't had before, act as goodwill ambassadors to any new or dubious foods. 6. Another pal is cream cheese. I often use it in place of mayonnaise, with ham, salmon, lettuces, or avocado. You can put almost anything between layers of cream cheese and it'll taste good. 7. 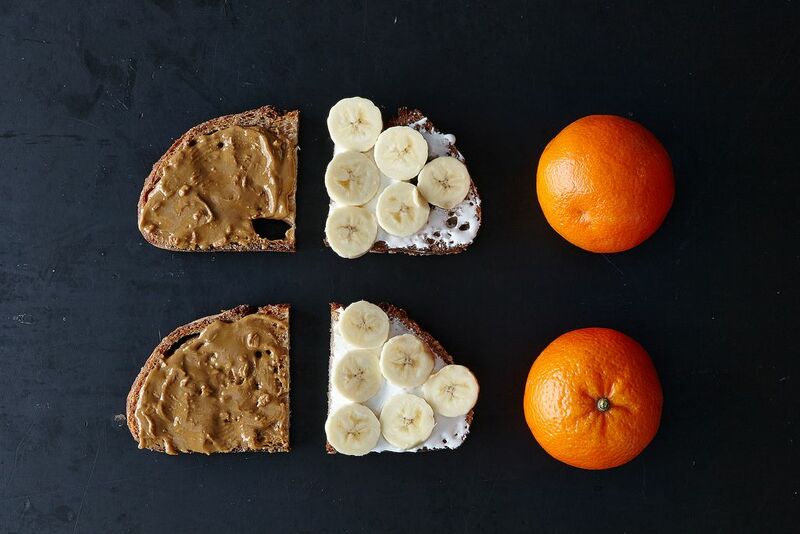 Always stock peanut butter and Fluff, so that when you're having a school lunch low moment, at the very least you can send your kids to school with iconic lunch fare: a peanut butter and Fluff sandwich. If the food police stop you, tell them you're educating your kids with vintage classics. Read on for more about the maker of our favorite nonperishable lunches, and the story of how they came to be. 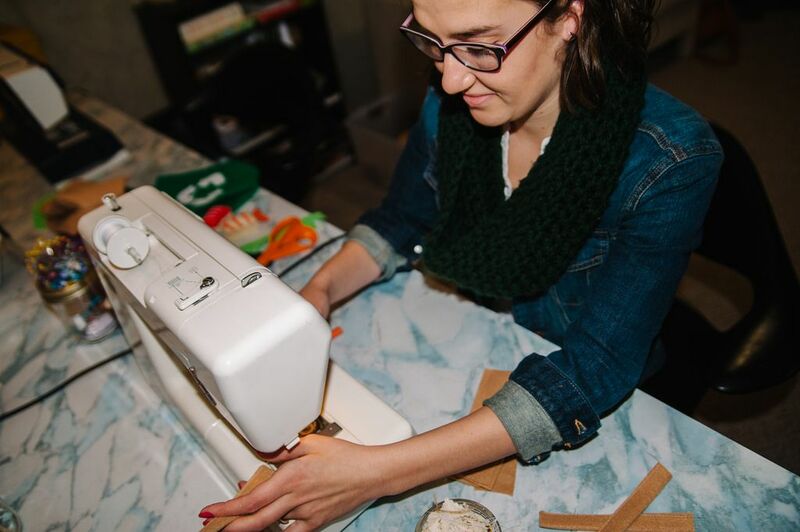 When Samantha Sweetman needed a gift for her husband's 7-year-old sister, she decided to make one. "In a single night, I stitched up a felt brown-bag lunch with a sandwich, apple, and bag of chips," she remembers. The gift was a hit. Not long after, Samantha got a booth at a local craft fair and made a few more felt foods to sell alongside some traditional crocheted items -- the felt foods were all that sold. "I've never heard so many people say 'This is so cute!' in my life," Samantha says. Coming full circle from that first sack lunch, Samantha's latest creations are felt iterations of her 5 favorite lunches from Amanda's column. She set out to recreate just 3, but with the help of her husband Josh and her mother Ena, ended up making 5 sets in a day and a half. "Making Amanda's kids' lunches has opened our eyes to so many combinations out there -- not just in real food, but in felt, too. A sandwich can be so much more than cheese and bologna." Whether you're more of a smoked salmon person or really just interested in peanut butter and fluff sandwiches (and there's no shame in that), Felter's Market has a set for the kid in everyone. 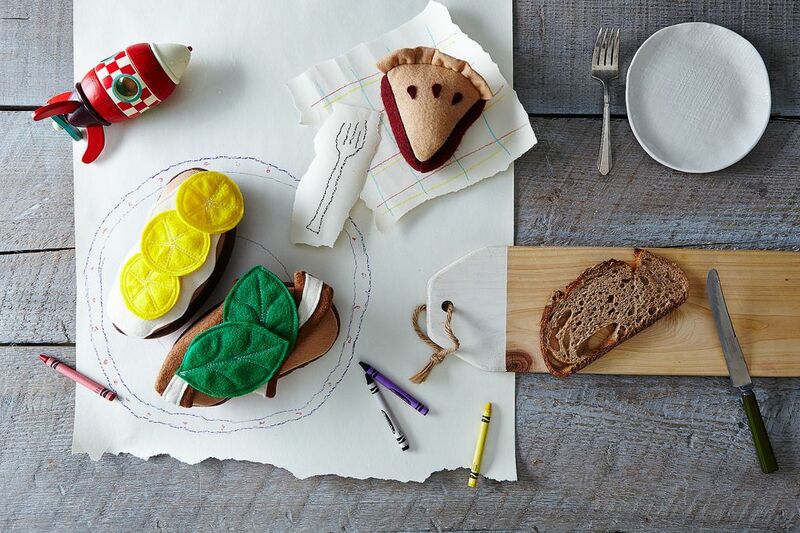 Shop the felt versions of Amanda's kids' lunches here! As a child, I hated sandwiches (and I am still very very very picky about them because bread that sticks to the roof of your mouth = gross), so I had to be creative about packed lunches. My favorites were roasted soybeans with salt, which my mom bought at the food co-op, and I used to drop them into my fruit on the bottom yogurt for a sweet-salty mix. I also liked triscuit cracker sandwiches with pepperoni, and an apple cut in half and sprinkled with cinnamon sugar so that it didn't go brown (and tasted amazing). The end piece is definitely the prize! My mom made cracked wheat bread every Sunday night in winter--and in her 60s, still does--and since it was just my dad & I fighting over it, we each got one end piece. (My mom selflessly ate only "middle" pieces.) I remember in second grade we had to make an illustration of our favorite food. Most of my classmates drew things like Cheetos and Twizzlers...not me. I carefully made a very detailed drawing of my mom's homemade cracked wheat bread. And oh, the lunch sandwiches that bread would make for the rest of the week! I live in Sydney, Australia, and almost all of our kindergartens/preschools, daycares and primary (elementary) schools are strict nut-free zones to protect children with anaphylactic allergies. So-no peanut butter (or Nutella hazelnut spread) sandwiches here! I believe this is a common thing in many Australian schools, not just Sydney. In any case our nationwide kids sandwich standby is Vegemite rather than PB & J! Amen, can't wait to visit Sydney. I was oblivious to nut allergies until my child, now I cannot believe how behind we are in sensitivity labeling here in my area of the SF Bay area. Still I think vegemite might be a tough sell. I live that you have Fluff and own up to it. My school lunches were usually pb no j on home baked bread (my mom was amazing) an apple and a Milky Way. The whole package is remembered forever, but my favorite was the home baked bread. Classic soft white loaf. We fought over the end piece warm out of the oven because mom rubbed the crust w butter while it was still warm. Did other people do that?